Umar Farooq found the Temple Mount to be a garbage dump for Jerusalem in the 7th century and personally cleaned and restored it! At the time of advent of Islam there were two Empires, the Roman and the Persian. The Persian Empire did not survive very long. So, it may be reasonable to ask, which of the two surviving Empires, the Roman Empire and the nascent Muslim Empire, did the most to give us our vision of the religious freedoms, in the seventh century. Umar Farooq (born 579 CE – died 6 November 644 CE), a close companion of the Holy Prophet Muhammad, may peace be on him, led the rapidly evolving Muslim Empire from 634-644 CE. Heraclius (Latin: Flavius Heraclius Augustus, 575 – February 11, 641) was Byzantine (Roman) Emperor from 610 to 641 CE. Heraclius and Umar Farooq were contemporaries and each stood for his respective cultures and Empires. By studying the two, we can track the history of religious freedom in organized human thought during the seventh century. In this short article I want to show that Islam is a religion of peace and that revelation has contributed in a big way to human knowledge and history. By mentioning Churches and Synagogues before Mosques, the revelation was laying the foundation of genuine religious freedom for the whole of humanity. These verses were revealed around 624 CE and these teachings through the practices of Prophet Muhammad, may peace be on him, in Arabia laid foundation of freedoms that were put into action by Umar Farooq, may Allah be pleased with him, in Jerusalem in 638 CE, when he took control of Jerusalem, after a relatively bloodless siege by the Muslim army. I visited Spain with my family during the spring vacation of 2011 CE and went to the central mosque of Cordoba, which was a mosque at least for three centuries, but, it is now a Cathedral. In the year 1492, which is also famous for Columbus having discovered America, not a single Muslim was left alive in Spain, either converted on the point of sword, banished or killed. In 2012, we visited Turkey and were very happy to see Hagia Sophia, which is a former Cathedral, later a mosque, and now a museum in Istanbul. From the date of its dedication in 360 CE until 1453 CE, it served as the Greek Patriarchal cathedral of Constantinople. The building was a mosque from 1453 until 1931, after Constantinople fell to the Ottoman. This is what groups did to the places of worship of others, the so called enemies, in medieval ages! But, now I want to share something more dramatic with you. 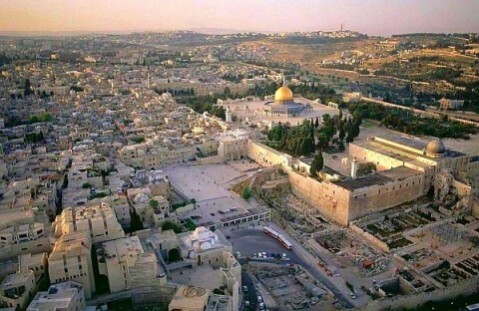 I want you to come with me and visit the holy land of Jerusalem. If you have been to Jerusalem you would have visited the Church of the Holy Sepulcher, one of the Holiest places in Christianity. The site is venerated as where Jesus was put on cross, and is said also to contain the place where Jesus was buried. It did not suffer the fate of the Mosque of Cordoba or the Hagia Sophia, because of the generosity, wisdom and religious tolerance of one man Umar, who was the second Caliph of Islam and a very close associate of the Holy Prophet Muhammad, may peace be on him. Jerusalem was under Muslim rule from 638 until the creation of Israel in 1948, except for a period of 80 years between the First and the Third Crusade. After a brief and bloodless siege, initiated after the offensives by the Byzantines colonies, Muslims seized control of Jerusalem from the Byzantines in February 638. Caliph Umar Farooq accepted the city’s surrender from Patriarch Sophronius in person. Umar, may Allah be pleased with him, was shown the great Church of the Holy Sepulcher and offered a place to pray in it, but he refused. He knew that if he prayed in the church, it would set a precedent that would lead to the building’s transformation into a mosque. He wanted the Christians to have their freedom of religion and their worship places. Therefore, he instead prayed on the steps outside, where Umar Mosque was built centuries later, allowing the church to remain a Christian holy place. While Heraclius was baptizing all Jews by force in 632 CE, Umar Farooq in 638 CE was restoring complete religious freedom to not only all the Jews in Jerusalem, but, also the Christians. Would it be a big stretch to say that Umar Farooq gave the modern world our positive vision of religious freedom, for every one? This verse from the chapter Al Hajj of the Holy Quran, is perhaps the shining foundation of our religious freedom in our Global Village, with its varied religions, creeds and ideologies. ← Is God Alive or Dead: A Metaphor for the Scriptures from the US Constitution?